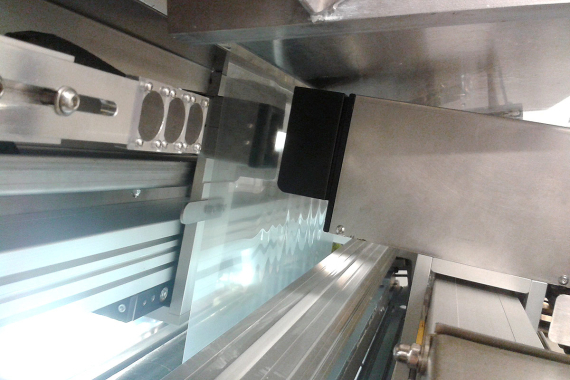 The Optigauge system is a solution that measures the thickness of thin film without using beta or x-ray radiation, but only light. The principle is very simple: the light can pass through a plastic film depending on the film transparency. With production of film not perfectly clear but with constant opacity, a portion of transmitted light beam will be absorbed by the film, more or less, depending just on the film thickness. As the sensor is a camera, there are few problems with mechanical misalignments as the camera can pinpoint the position of the maximum light spot and measure just it. The main advantage of the Optiguage is that it can check and manage situations with non-uniform color distribution. The camera works on a very small portion of surface (typically 10x10mm), so the image shows something that cannot be seen without the use of a microscope. A typical application is colored thin film production, with colored coating on clear support.